I really enjoyed writing Turning Final, A Life Complete, because it gave me the opportunity to relive many of my life’s experiences. I respond that about two years before I started writing the book, I carried a day timer around with me every where I went. When I thought of an incident that I felt was “write worthy,” I jotted down a one line memory jogger because as you go through each day your memory brings up incidents that you have been involved with and then you lose them and can’t get them back. When I started to write the book, I had over 400 one line memory joggers of incidents that I thought were write worthy. I used about 2/3 of them. By writing down a memory jogger, I was able to retrieve those write worthy stories that formed the basis for a story about a 45-years of flying and a boating career that were intertwined. 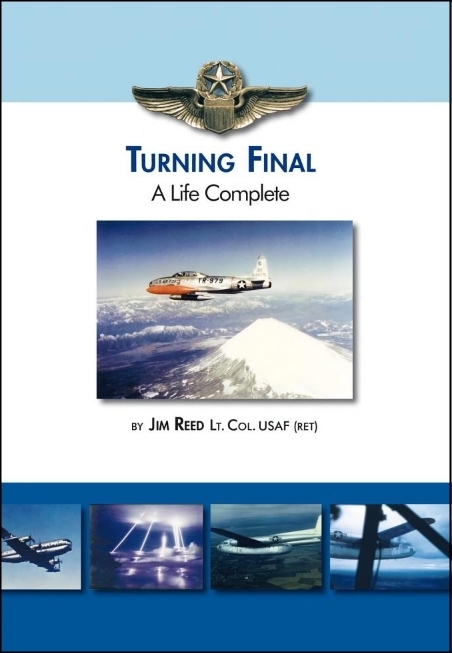 The first book I published was titled Turning Final, A Pilots Autobiography. There were several incidents that I wanted to include in that book that were highly classified and I could not get the permission from the Air Force to include them. After the first book was published, I received permission from the office of the Secretary of the Air Force to use the stories in the book. I then republished the book with the new title Turning Final, A Life Complete with the incidents, as well as several other stories. I am particularly gratified by some of the comments I have received about the book – mostly from people who have been in the aviation or boating industries, but also from people who love to read real life adventure stories. The book is really a series of stories that I was either directly involved with or on the edge of and the beginning of each story is noted by an asterisk (*). Life is full of stories, and as I’ve said, my book constitutes just a sampling of mine. Each day we create new memories and stories; I hope my book encourages you to keep a book of “write worthy” anecdotes and set off on your great adventure.